Design your own protein blend with our high quality raw ingredients! Choose from over 40 types of protein and carb powders and over 20 flavor/sweetener options. Make it grass-fed, paleo, vegan...put in everything you want and nothing you don't. Make it yours and tailor it to your tastes and activities - you tell us what goes in, we mix it, package it how you want, and ship it to you! Design your own custom oatmeal - choose your type of oats (instant, old-fashioned, steel-cut, gluten free) and then customize from our large selection of dried fruits, nuts, seeds! You can even add our tasty flavors and sweeteners for a truly delicious and healthy mix. It only takes about 30 seconds to make your choices...then we mix it all together and ship it to you. A fat free and sugar free whey protein isolate! Whey Protein Isolate Microfiltered is produced as a byproduct of cheese which undergoes two cold-water microfiltration processes in order to remove unwanted fat and lactose, resulting in a protein-packed powder that is both fat free and sugar free. Whey Protein Isolate Microfiltered is a great-tasting and easy-mixing protein option for post-workout nutrition or as needed in your daily diet! True Nutrition's Whey Protein Isolate Microfiltered is strictly sourced from the industry leaders in the USA. Providing 27g of protein to help support muscle-building! Uses: Supports Muscle Building: Provides 27g of protein to help support muscle building! Mix-ability: Mixes easily in shaker cup or blender. Taste: Light milky taste that goes great with all flavors! Mix 1 Serving (About 1 Scoop) in 8-12floz of water, juice, or milk. Shake or stir, and enjoy! Whey Protein Isolate (Milk), Lecithin (Soy). TrueFlavors: Flavoring (Natural Flavoring Extracts, non-GMO Rice Powder, Gum Acacia, Stevia). Natural Premium Flavoring: Flavoring (Natural Flavoring and Coloring, Stevia, Maltodextrin). Other Flavoring: Flavoring (Natural and Artificial Flavoring and Coloring, Acesulfame Potassium, Sucralose, Modified Food Starch, Silicon Dioxide, Maltodextrin). The order quantity will be combined in to a single container when possible based on the total volume of material ordered, or split in to several containers when needed. The EZ-Seal Upright Mylar Bag option contains a standard 70cc scoop, is resealable, and will be heat-sealed for your protection. The Plastic Jug option contains a standard 70cc scoop, an interior lining, and will be heat-sealed for your protection. If you are currently pregnant or nursing, consult a physician prior to use. Keep out of the reach of children. CONTAINS: MILK, SOY. Although this product may not contain one or all of the following, this product is manufactured in a facility that handles milk, soy, egg, peanut, nut, tree, fish, crustaceans/shellfish, and wheat products. Use this product as a food supplement only. Do not use for weight reduction. Use the table below to approximate the gram equivalent weight for a given level measuring spoon (US Standard). Please note that accurate dosing should only be done with a recommended calibrated scale. Definitely a great product. I got this because I have known so many great bodybuilders to use TN. I also follow and respect Dante and the level of transparency the company has via their 3rd party testing of their products. This product, in particular, I got in the unflavored variety so that I could mix the protein with other flavored powders such as highly branched cyclic dextrins. The protein mixes well with the other supplements. The only bad thing about the mixing is that it froths up slightly, but that's not a big deal. Drinking it as a stand-alone supplement, the product is virtually flavorless/neutral. You can add flavored drink mixes such as Mio to the protein if you want some flavor for your protein shake. It comes out with a little bit of a dairy-like flavor with the drink mix which is to be expected. Mixing something like a Strawberry Mio with it would result in a taste similar to what I would expect a Strawberries and Cream to taste. Clean and digests well. If you have had issues with the concentrate or hydrolyzed whey setting well on your stomach, then try this. I've had no issues what so ever. I've mixed it well with BCAA powder for after workouts using the BCAA suggested serving. I took the mixing ball out of the mixer bottle because it mixed best that way (no clumping.). I noticed a big difference when I went to three drinks a day on workout days. The first was the Whey Microfiltered/BCAA mix, then two later in the day with just whey. This whey protein isolate is awesome and dissolves easily. Earlier this year (2015), True Nutrition stopped selling this type of whey protein isolate for a while. Fortunately, they are selling it again. Please keep stocking and selling this. If you do so, you will have a customer for life. One of the cleanest and best-tasting proteins I have ever used! WARNINGS: If pregnant/nursing, consult physician prior to use. Keep away from children. This product is manufactured in a facility that handles milk, soy, egg, peanut, tree nut, fish/shellfish, and wheat. ** Percent Daily Values not established. The above statement has not been evaluated by the FDA. This product is not intended to diagnose or treat any disease. Share this product now and save 5%! True Nutrition was established on the values of our customers not the owner’s wallets. True Nutrition absolutely refuses to cut any corners when it comes to product quality, product validity and product manufacturing. We're always doing new and exciting things. Stay up to date with the latest promos, new products and flavors. Please note that you can add, subtract, and change ingredient % as well - but we only recommend this for advanced users. You're more than welcome to make any changes you wish to the ingredients in your custom blend, however we usually only recommend this for advanced users. 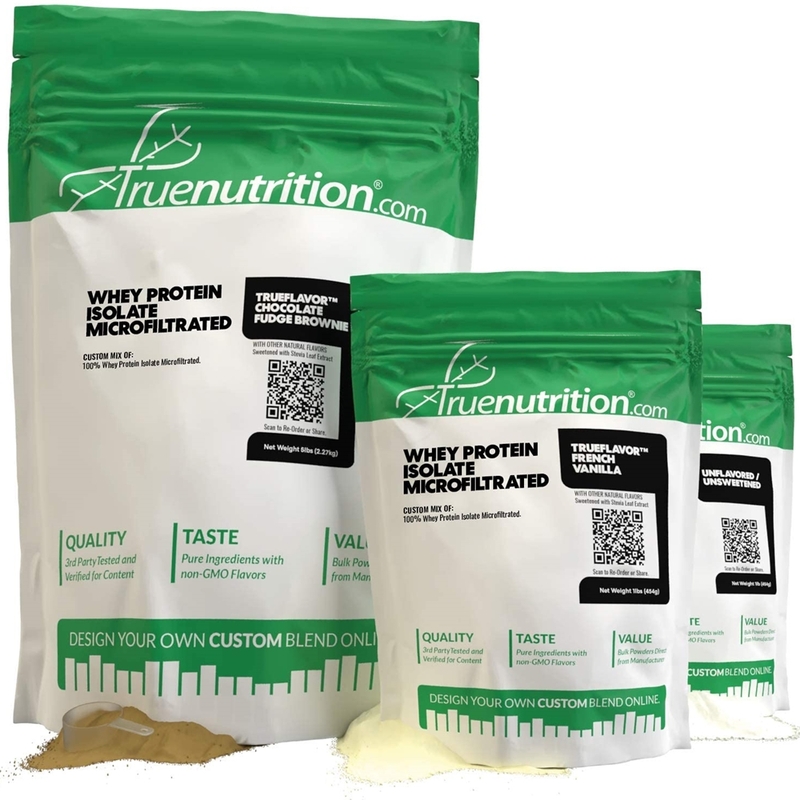 TrueNutrition® is amazing because we let you customize your own blends to fit your goals, tastes, diet, lifestyle, and budget...Now with our new Coach™, just answer a few questions about yourself and in a few easy steps we'll help you find the custom product combination that's right for you! If you are an existing customer but are not logged in, please so below before proceeding. If you have never ordered from us before, Welcome! Select all options below that describe your additional goals.